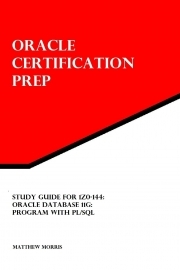 Description of "Study Guide for 1Z0-144: Oracle Database 11g: Program with PL/SQL"
This Study Guide is targeted at IT professionals who are working towards becoming an Oracle Certified Associate in the PL/SQL developer track. The book provides information covering all of the exam topics for the Oracle certification exam: "1Z0-144: Oracle Database 11g: Program with PL/SQL". Matthew Morris has worked with the Oracle database since 1996 when he worked in the RDBMS support team for Oracle Support Services. Employed by Oracle for over eleven years in support and development positions, Matthew was an early adopter of the Oracle Certified Professional program. He was one of the first one hundred Oracle Certified Database Administrators (version 7.3) and was also in the first hundred to become an Oracle Certified Forms Developer. In the years since, he has upgraded his Database Administrator certification for releases 8i, 9i, 10G and 11G, added the Application Express and the Oracle SQL Expert certifications and the PL/SQL Developer OCA certification. Outside of Oracle, he has CompTIA certifications in Linux+ and Security+. Reviews of "Study Guide for 1Z0-144: Oracle Database 11g: Program with PL/SQL"
The Study Guide for 1Z0-144,is an Excellent book for the preparation of 1Z0-144:Oracle Database 11g: Program with PL/SQL, which is supposed to be the one of the toughest exams from oracle at the OCA level. All the topics are very neatly covered. Before studying these topics one has to refer to the oracle documentation in understanding the concepts. There Could have been some more examples for few topics like Parallel_enable, UTL_MAIL, DETERMINISTIC, PARALLEL_ENABLE and appropriate references to the oracle documentation could have been given. Finally I thank the author for a wonderful book with which i have cleared this exam.